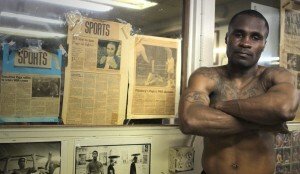 Adoring the walls of King’s Gym on 35th St. in Oakland are legions of fight posters and photographs that likely number in the thousands. Among the plethora of worn and torn snapshots of history are a handful from the glory days of Pittsburg’s James Page, the one-time WBA welterweight champion who held the crown briefly from 1998-1999. Now, more than a dozen years since he first defeated Andrey Pestryaev of Russia in two rounds for the vacant title, Page has returned to the famed East Bay boxing gym as he readies himself to climb back into the ring for the first time since losing in his attempt to regain his crown against Andrew Lewis in 2001. It was announced Wednesday that Page will fight Nov. 17 in Sacramento at the Four Points by Sheraton against Cleven Ishe of Long Beach, a tough journeyman who is much better than his modest record would suggest. Though the HBO-televised 7th round technical knockout by Lewis definitely knocked Page back a bit, it was personal problems out of the ring that derailed the fighter’s once promising career. A December 2001 incarceration landed Page in the big house for an 11-year sentence, which came to an end earlier this year. Now in a much better place, Page sees an opportunity to give advice to some of the younger crop of fighters that have begun to make their way into northern California, which has become a hotbed for talent as of late with Andre Ward trainer Virgil Hunter building an impressive stable of contenders that work at King’s quite often. While enduring that long stretch behind bars, Page never let himself get out of shape. As a prizefighter at his peak, Page was a 147-pound welterweight known for possessing one of the biggest punches in the sport. He came out of prison not much heavier, weighing closer to the 160-pound middleweight limit, maintaining a solid physique thanks to a dedicated daily regimen. His return to the ring against Ishe next month will take place closer to the junior middleweight limit of 154 pounds. Ishe is a fighter whose record is more a representation of hard luck than lack of ability and should be taken seriously by Page. He has a history of picking up fights on extremely short notice and has only been stopped twice in nine losses. His awkward style of leaping in with punches is also one which a fighter trying to shake off many years of rust might have a hard time looking great against. With more than a month to prepare rather than 24 or 48 hours, as well as the opportunity to add a former world champion to his résumé should serve as more than enough motivation. Since returning to the gym, Page’s team has been trying to find him a fight with some difficulty. His comeback was nearly a reality a few months ago when a spot was held for him to fight on a card slated to take place in San Francisco on Aug. 17. The card, was going to be televised nationally by ESPN2 but fell by the wayside when headliner Karim Mayfield withdrew following an injury. Instead, Page will fight further off the radar as it takes place on the second club show in two months from new promoter OPP Presents. To go from the bright lights of premium cable television to the untelevised club circuit is a harsh reality that plague many in the sport. For most, deterioration from punishment inflicted in the ring is a usual cause to being knocked down a peg or two. Aside from a 1999 Showtime-televised war with Jose Luis Lopez, Page has not been in too many fights that would have you believe he has eroded. Ten years of not taking punches could work in his favor, preserving him for another day. The hourglass on Page’s career is running thin But an encouraging sign in support of Page’s journey are the words of young junior middleweight prospect Omar Henry, who relocated to San Jose for a recent training camp and sparred a number of rounds with the 41-year old Page at King’s a few months ago. “We sparred ten rounds one day,” said Henry when recalling their sparring prior to his victory over Tyrone Selders in June. When asked whether he thinks that fire in the ring with the headgear and bigger gloves will carry into the ring on fight night, Henry was confident. After being out of the ring for so long, you have to wonder what kind of nerves Page has heading into battle for the first time in over a decade. The question is, when did Page arrive at that realization he still had something left to give? “The first time me and Omar Henry sparred, I just happened to walk into the gym on a whim,” recalled Page. At 41 years old, it is a longshot that Page regains his former glory. However, reunited with his former team that led him to a title, headed by DeLawrence “Dee” Miller, Page seems to be on the right track and free from the personal demons that plagued his prime. For now, Page is back at King’s, plugging away, hoping to find his timing as he attempts to make a comeback that—if successful—would no doubt serve as interesting source material for a biopic. Mark Ortega is a staff writer for queensberry-rules.com and can be reached via e-mail at markeortega@gmail.com.